Universal covers for inflatable boats. 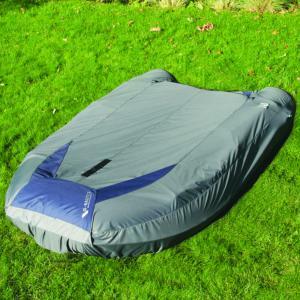 This cover fits any boat from 320cm-380cm. PU Coated polyester cover fits most popular inflatable boats. Originally designed to cover the boat to the transom plate it is not necessary to remove the engine. The multiple strap assembling points give greater flexibilty with length and two bottom straps with quick release buckles keep the cover in place while stowed on deck or in the davits. One middle strap pulls the cover tightly to the transom plate and two back straps secure it to the back tube. There is a pull strap for extra fixing to the bottom. click here for full fitting instructions for G Nautics Dinghy Covers.